To create goal scoring opportunities, we need our teammates to make forward runs such that we can make defence splitting passes to them. This tutorial will explain how to make such player runs in PES 2014. 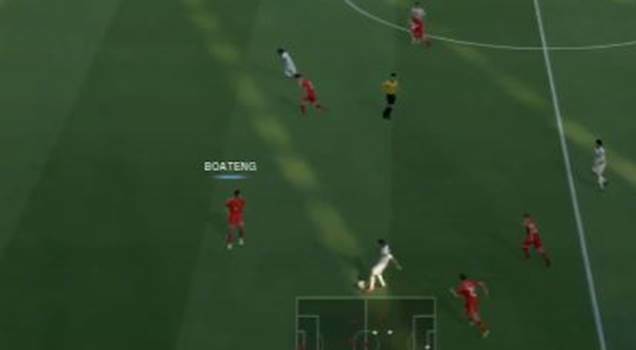 The FIFA gameplay system has, in my opinion, an easy and effective player run system. You can trigger a player run by facing the teammate, and pressing L1/LB, and you can repeat this for multiple teammates and send half of your team up front. PES uses a different system. For years, player runs can only be made by the player who just passed the ball. Hold L1/LB and make a ground pass, and the player will run forward. Alternatively, you can double tap R2/RT after pressing the ground pass button to make a forward run. 2 to 3 years back, PES introduced another player run method, which is rather similar to FIFA’s. There were two settings to choose from, Assisted and Manual. Whichever setting you chose, the logic is the same – Point the Right Analog Stick to your teammate, and press down the Stick button to trigger the forward run. On Assisted Setting, your teammate will make a straight run forward. On manual setting, you can keep the stick button held down, and use the stick to control the direction of his run. I personally find it hard to use this to my advantage. It is quite tricky to point the stick, press down the stick, hold down the stick, and use it to control my teammate’s direction of runs. Thankfully, Konami recognised this, and made slight tweaks to the system. In PES 2014, the same two settings, Assisted and Manual, remains. To trigger a player run, we now hold the L1/LB button, and push the Right Analog Stick in the direction of our teammate. We will see an arrow forming slowly on the screen, and the player in the direction of the arrow will be activated. On Assisted setting, that player will make a straight forward run. On Manual setting, we can use the right analog stick to control his movement and direction, as long as we keep the L1/LB button held down. In my opinion this is much easier to execute as compared to holding down the Right Analog Stick button. The L1/LB button is easier to handle, and the new system makes triggering player runs so much more straightforward. One thing that is lacking is the ability to trigger multiple player runs. Once a player run is triggered, that player has to stop running before you can point the right analog stick at another player to start another run. This means we can’t just sit back and send many teammates forward at the same time. Fortunately, there is a way around this. We can still use the “traditional” method of L1/LB + Pass, or double tapping R2/RT after making a pass, to trigger the passer to run forward. With a combination of these methods and the new player run system, we will be able to send more players forward when launching attacks. Traditional Method 1 – Hold L1/LB + Ground Pass. Passer will make forward run. Traditional Method 2 – Make a ground pass, and before teammate receives the ball, double tap R2/RT. Passer will make forward run. New System (Assisted Setting) – Hold L1/LB and Push Right Analog Stick in the direction of teammate. New System (Manual Setting) – Hold L1/LB and Push Right Analog Stick in the direction of teammate, keep L1/LB held down and use Right Analog Stick to control teammate’s movement. Push Right Analog Stick in desired direction and release for teammate to run in that direction. Video tutorials will be created for members soon. Enjoy attacking in numbers! PES 2014 for PC: does anyone knows how to make a teammate run using the keyboard?! Holding L1/LB and right analog stick equivalents doesn’t work. I’ve tried dozens of key different combinations and I still can’t make other players run like I was able to do in PES 2013… I’m about to quit. I found in a lot of situation that when i trigger team mate to run…it happened that my team mate from back is selected. Of course i push the direction to my forward player, but again somehow player from back is triggered. This sound a little weird. May I check if you are using assisted teammate controls or manual teammate controls? To trigger a player run, hold L1 (PS3) or LB (XBOX) and push right stick in the direction of the teammate you wish to make a forward run. Ensure that the blue arrow points in his direction, and he will begin his run with a blue bar appearing over his head. If you are still facing issue, can you please send me a screenshot? My email can be found in the member’s area welcome page after you log in.